Big Data: Is it Ready for Prime Time in Customer Experience Management? The OSS software biz has never been an easy one for high tech titans to dominate. Microsoft and Google compete only on the edges of the business. And the major system and test giants have all found telecom to be a tough one to scale-up. One of the biggest obstacles, of course, is that telecom doesn‘t obey the same laws as retail or e-commerce. It may look like a global industry, but telecom is more like a global village with a ton of location-specific problems to be ironed out. And the always-on, multi-vendor, and technically-muddy nature of the business requires special expertise. So having a sales machine, international brand, and a scalable business model gives you less of an edge. Switzerland-based Nexus Telecom is a David among Goliaths. It’s the poster child for the many OSS companies who defy the conventional wisdom that niche, expertise-rich companies can‘t survive in the same market as an HP, Tektronix, or Ericsson. We’re delighted to interview Thomas Sutter, former CEO and now the COO of Nexus and one of the company’s guiding lights in Nexus‘ 20 years as a private company. Thomas talks about his hot issue of the moment: Big Data — its promise and its challenges in Customer Experience Management (CEM). But he offers plenty of other good reasons to read on: his advice on managing technology risks, his major partnering bid with Aito, and his straight-shooting talk on the OSS supplier’s landscape. Dan Baker: Thomas, what’s your beef with Big Data? Do you feel it’s overly hyped? Thomas Sutter: Actually, Dan, in many cases I think the positive press and advertising around Big Data is justified because there have been some great success stories in consumer industries utilizing e-commerce platforms. I’m now consulting for a large international operator. A new CTO is onboard and his first mission is to analyze the B/OSS stack in the countries where they operate, with the target to come up with a blueprint recommendation for the architecture and tools. But I say, where are the reference customers or projects that prove Big Data works in OSS? They don‘t exist yet. Now if you go back 10 years, CEM was in a similar situation. And I would contend that it’s taken 10 years for mature CEM products to appear: only now can people really claim that CEM products can deliver a return on investment. The technology around Big Data is powerful, but replacing five or six OSS platforms with a so-called Big Data Management System is a very risky strategy at this point. Why are these carriers rushing to deploy Big Data if it’s so risky? Often it’s a new CTO or CFO who sees an opportunity to replace legacy with big data management systems. He’s looking for a way to reduce OPEX by replacing 4 or 5 systems and create new benefits at the same time. And frankly, we’re all pushed to save costs, and reduce OPEX and the number of platforms. So Big Data is being sold as providing that. Now I try to dissuade those people, saying, “Instead of a Big Data platform, you should buy a niche product which creates the benefit for the department looking for a solution.” They don‘t like to hear that necessarily. Five years out, I’m certain this rush to Big Data solutions in OSS will end in unofficial disaster. Sure, you’ll create some additional value, however all the legacy systems will still be there because some functionality could not be replaced and is still needed. The niches of expertise supplied by best-of-breed products are not fully understood. Because of that, those products will still be in production and the OPEX savings will not be realized. And at the end of the project the benefit is no longer in balance with the cost. But to be honest, what operator truly tracks the business case or all OSS/BSS projects to the end of the lifecycle? Not many in my estimation. Instead, the tracking is lost over the time of the lifecycle, especially in the instance of CEM, and thus is never proven. And so, the decision to rush into new technology (as an early adopter) is not always wise. Nowaday’s CTO’s leave the company before failure is recognized. At the point in time when the business case is falling apart, there is no one to blame and the cycle repeats itself when the next silver-bullet technology arrives. But it’s not about the blame, it’s about the learning and potential saving of money in the long term. Besides the fast speed and low cost of hardware in Big Data, another attraction of this new analytics world is the ability to search unstructured data as companies like Splunk and Ontology are spearheading. Yes, if you can load data from any data source without formal integration, a lot of the headaches go away. And I was impressed with the Splunk model when I heard about how successful a German retail company was with it. Unfortunately, their license model is based on incremental data per day. Based on this, in the OSS/BSS business, as soon as you load network data, the Splunk technology is unaffordable. And if you filter and aggregate the data before feeding it into Splunk, the search capability in unstructured data becomes redundant. Since Nexus is pulling down raw IP data off a telecom network, that data traffic could be something like 60 Gigabits/second. After some filtering and correlation based on our intelligent technology, this becomes 1-2 terabits per day. Another problem with Big Data platforms is that it’s a one-way highway. It’s fine when your goal is to launch a marketing campaign, but in CEM you often need to also take immediate action to troubleshoot the network because operational efficiency means reduction of your Mean Time to Repair. That means you need to dip back into the network again to do extended analysis on, for example, raw network data to find the root cause of an unhappy customer. If the Mean Time to Repair is reduced, customer satisfaction goes up. In the case of Splunk, if I load all the log files from the Cisco routers and computer, the logs might not show battery errors because all is well, but for certain analyses you need to know the levels of the battery life for trending and forecasting. And when you run a 24 x 7 network, you need a way to actively probe and discover the status of batteries right now. And you may need to drill down deep through telecom protocols to find the root cause. So the missing ingredient that’s yet to be added to Big Data for CEM is the active feedback loop to the network, and that can only be delivered by people who are experts in the respective OSS niche. This is based on years of processing and knowing which use cases are necessary, and thus the raw data is quickly transformed. Well the notion of “niche experts” leads me to the Nexus business. Nexus is a best of breed product company in an OSS solutions market that’s increasingly dominated by very large vendors -- players who sport a wide portfolio of products. Dan, to survive as a OSS product supplier as long as we have, you can‘t rely on consultants and integrators to resell your products. You must define concrete use cases. Should I support the guy in the roaming department, revenue assurance, or both? You need to decide where you want to be excellent in understanding your customer business. You need to be out there with your customers and seeing again and again what the most burning Use Cases are, where they need (product) support to be fast enough or to reach the expected quality. I have to understand the business situation of my customer, from the Roaming Manager to the Network Center Operator. This is changing drastically. And if you do a good job, you can then sustainably grow your customer base by 3 or 4 customers a year. Then in about 10 years, you finally earn your stripes as a respectable player. Because if your existing customer is always treated #1 before potential new customers, you can probably not grow faster. I would say we are especially good for getting clients through a crisis. For instance, LTE is being introduced and tomorrow the client changes his mind regarding priorities and needs to monitor something new. In many cases, we can do that completely different than planned. On the other hand, the client wants a big data solution, I have to say “no” because I’m selling proven technology applied in a certain niche and sold as a turnkey solution based on something off-the-shelf and designed to address a limited number of use cases and has a well defined functionality. I’ll say one thing, Thomas, it’s pretty rare these days to run into an engineer COO / ex-CEO at an OSS company. How did you grow your business? Certainly one of the reasons I am still a leader at this company is that we are private. If we were venture financed, I would have probably lost my job long ago because they might not like my engineering-style. Our big break, I think, came in 2003 when we bought our wireless product assets at the end of the telecom recession. The former owner was Acterna (today JDSU), a big test and measurement firm, which went through Chapter 11 bankruptcy. Interestingly enough, when Acterna got on its feet again within JDSU, it noticed that wireless monitoring was a hole in their portfolio, so that’s one reason they acquired Agilent and became a competitor of ours. If you compare the two companies, one built a product out of hard work, and the other had to spend a lot of money to buy a mature product line. This can‘t necessarily be justified by ROI. Now in addressing the CEM market, you’ve taken an interesting course by partnering with a relatively new analytics vendor, Aito Technologies out of Finland. Yes, and you have to think long and hard before you partner like that because getting the business model right is complicated and you need to synch with your partner on a cultural level too. But in our case we knew that CEM is something that happens at the business layer and having a knowledge of network data is not enough. You have west and eastbound integration towards topology data, customer data, revenue data, and you need to look at the customer holistically. Our core competence at Nexus is providing the data about the subscriber -- not just network data -- but also what the customer is doing on the internet and how are they accessing OTT sites like Facebook and Google. And how much time do they spend on these sites? This information is highly interesting for customer service and marketing. And that’s where Aito comes in. It’s not just a matter of quality of service but finding out which subscriber is a big spender and making sure when he comes home in the evening he doesn‘t experience a lot of dropped calls or data access failures. And so far, we don‘t need expanded Big Data technology to do this. A lot of what we do is based on open source technology and other traditional hardware. Pricing is the next thing I need to be careful about. If I have licensing models like Splunk, I have no chance, because the time is over when operators have $5 million to spend. We need to deliver CEM functionality for a half a million, $1 million or $2 million. That’s it. H0w are the roles divided between Nexus and Aito Technologies? There is an intelligence data acquisition layer based on probes, so we are not dependent on an interface to other monitoring companies. We are probing the network and go to physical links. We provide the applications for service assurance, for roaming management, for device assurance, signaling monitoring and so on. Now it’s in the business layer where CEM module ofAito comes in. They load data from Nexus and the key advantage is they don‘t require real-time data. Everything that’s needed in real-time we do in the Nexus framework. At the same time, Aito is also loading data from the billing chain. 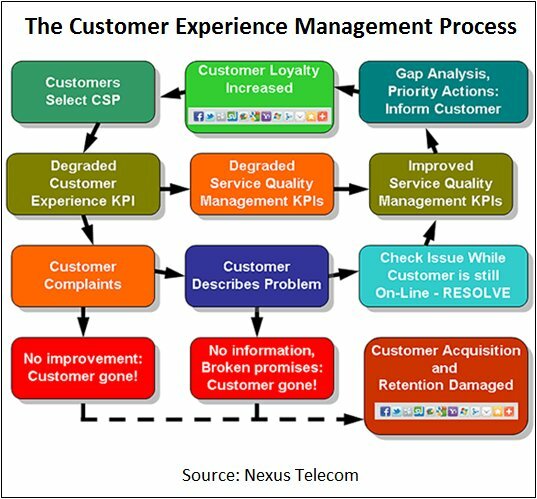 So the information about the ARPU of the customer and how much revenue they spend for what is key. They also load data from the customer care system, track complaint records and the topology data in what cells the customer is located, etc. The neat thing is that from an architectural standpoint we are still independent. Which means if we are installed at Deutsche Telekom, we can cover the gamut of service assurance, troubleshooting and roaming management applications and deliver data to departments like fraud, RA, etc. Then on top of that we can also plug in this CEM business layer through our relationship with Aito. And the integration part, we deliver to you as a turnkey solution. So we have an answer for both headaches: you get experts who understand their niche in two different areas and we also assume the integration risk. Combine that with a low price and it’s a very attractive offer. Today I’m answering RFPs at a faster rate than I have in the last 10 years. A few years ago there was a big consolidation in the service assurance market. IBM, HP, EMC, Computer Associates, and others made big investments. Five or six years later, how effective were they? To be honest, I’m still waiting to hear a reference case where a large operator actually replaced several OSS/BSS functions successfully? So far, I haven‘t seen it. As far as I can tell, everything is still there, and the newest solutions are simply dropped on top. Sure, every once in a while small steps are taken to optimize the architecture by replacing a piece here and there. But normally the legacy runs much longer than the business plan. Micromuse is no stronger now than it was before IBM bought them. Today the company is buried inside the big IBM cake. You don‘t really see them anymore. I’m sure they still have a large installed base from the Micromuse days. But there’s now some bigger distance between the former Micromuse customer and the product expert. But at Nexus we hold regular user group meetings with our key customers together with our experts and service management team in small circles to discuss what’s coming down the road. What’s the future? Where’s the market going? After a while it becomes a family business. When people look at me and Nexus, they know our business depends on remaining good in service assurance and service monitoring. So they can talk to me about the issues they have and we go far to support them. Thomas Sutter is COO of Nexus Telecom and is responsible for overseeing management of the entire company. Prior to joining Nexus, Thomas was CEO of P-Net AG, a privately held solution integrator for service management solutions operating in the Swiss market. He has also worked in a number of different departments for Siemens International.